‘Getting away from it all’ may be as close as your own back yard. Use these 7 design elements to create an outdoor space that speaks ‘Sanctuary’ to your soul. Amid the hustle and bustle, create a peaceful oasis; a ‘sanctuary garden.’ It need not be expensive. A comfy chair and side table, flowers in a jar and a good book can be every bit as refreshing as an elaborate fountain. Beyond the plants are other, often overlooked design elements that contribute to a sense of safe haven. Let them spark your imagination and put you on the path to an outdoor hangout of your own. Create a special entrance that enfolds and invites the visitor into sanctuary while providing the desired level of privacy. Take advantage of water’s soothing powers by installing a water feature, whether an elaborate waterfall or a bubbling rock. Creatively use color and lighting for effect; perhaps silvery plants best seen by moonlight or discretely placed lighting to heighten the drama while guiding the way. Design welcoming sitting areas with comfortable garden furniture or an interesting bench placed in a peaceful spot. Include a few favorite things – a quilt; shells – whatever says ‘home’ to you. 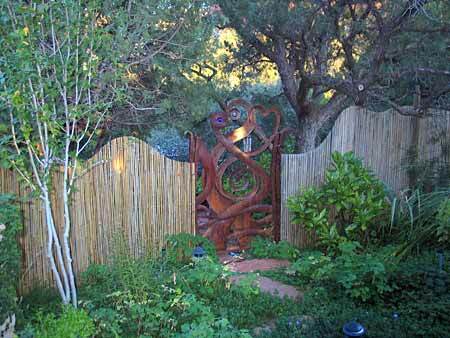 Highlight natural features and materials: rocks, wood, natural fences, screens, trellises and so on. Integrate art that enhances the overall mood – a beautiful ceramic pot or wind-powered sculpture. Provide habitat and features to attract a diversity of wildlife – perhaps a bird bath and a couple bird feeders. 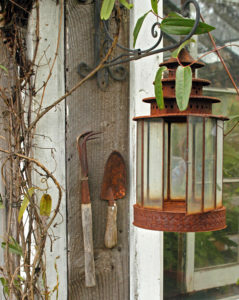 Bark & Garden can help you select lovely, drought-tolerant plants that attract birds, butterflies and other nice things. 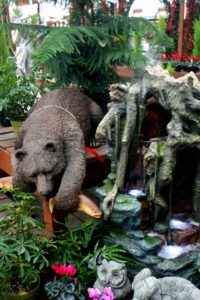 Look no further than Bark & Garden Center for unique garden art, statuary, fountains, bird baths and feeders. We’ve got the plants, shrubs and trees to help make your sanctuary garden a peaceful, welcoming place for you and your guests – should you decide to invite any!